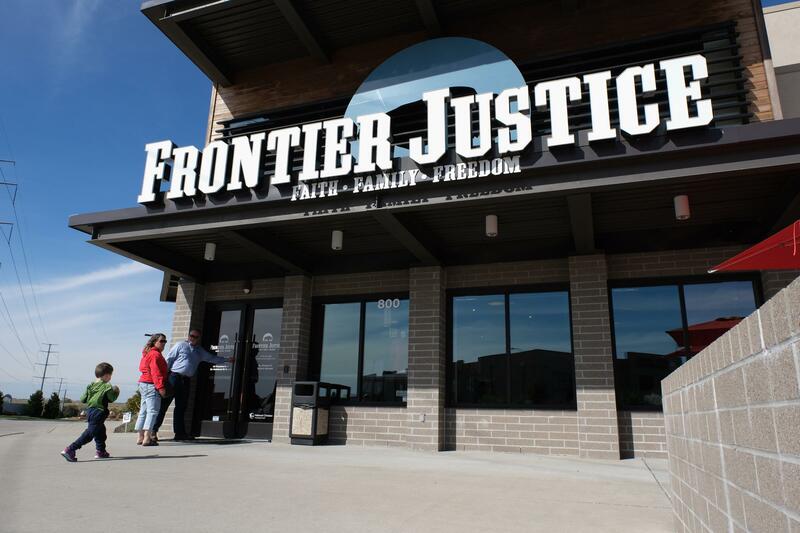 Bren Brown and her husband Mike opened the first Frontier Justice in 2015. The store features an indoor shooting range and women's fashion boutique. Customers like Corum, Knox and Nugent are what Bren and Mike Brown had in mind when they opened Frontier Justice three years ago in Lee's Summit. "There's nothing like this across the United States," Bren Brown says as she walks around the 33,000-square-foot facility. 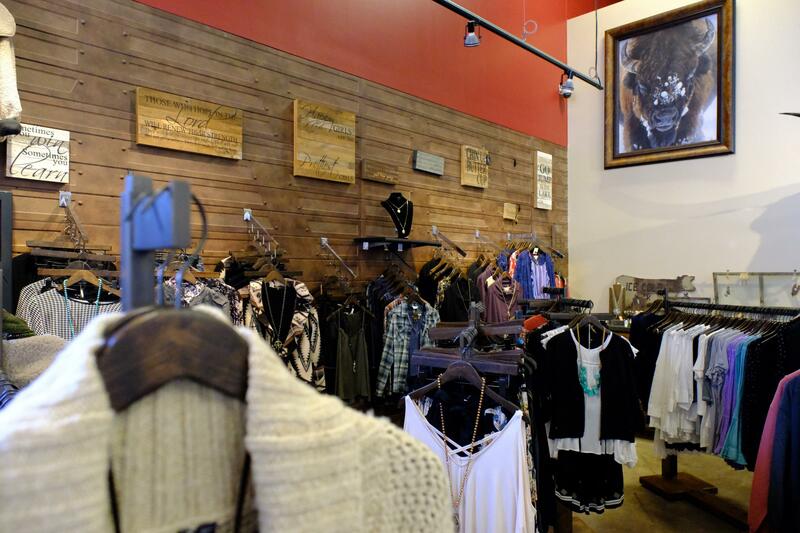 With a women's fashion boutique, small cafe and concierge-style service for VIP members, Frontier Justice offers women and families a shopping experience more tailored to their needs than most gun stores and shooting ranges, Brown says. The concept could be an important development for the $11 billion retail gun industry, which is increasing efforts to target women amid sluggish gun sales that have prevailed ever since the 2016 election. Frontier Justice regularly hosts events, such as book signings or date night. 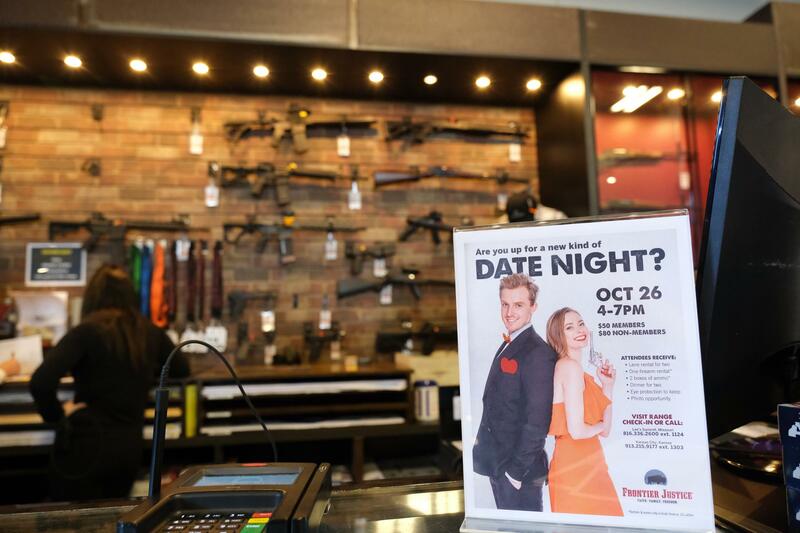 Each paying couple gets a gun and shooting lane rental, two boxes of ammunition, dinner for two and a keepsake photo. 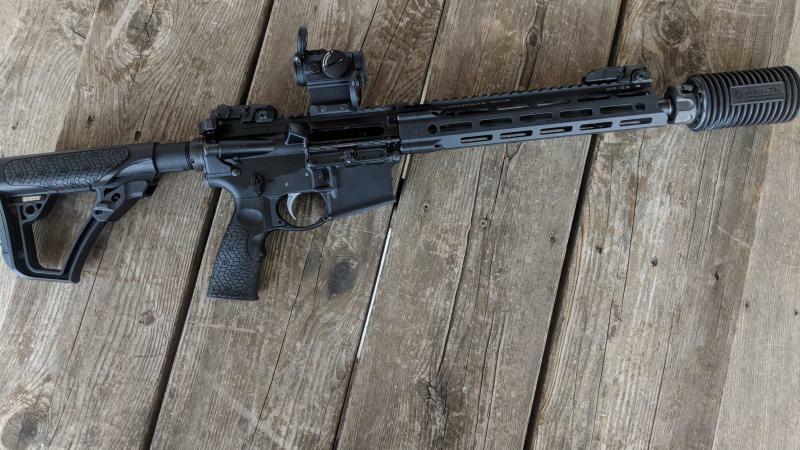 'Very Small And Very Powerless"
Gun stores typically fall into one of two categories: big-box retailers that cater to hunters or small shops packed with row after row of rifles. Brown says she noticed husbands and wives would sometimes walk together into a sporting goods store like Cabela's with their children, only for the wife and kids to return outside and wait in their car while the husband finished shopping. And smaller stores, which sometimes have low ceilings, dingy floors and little natural light, seem too unwelcoming for some women to even consider, she says. 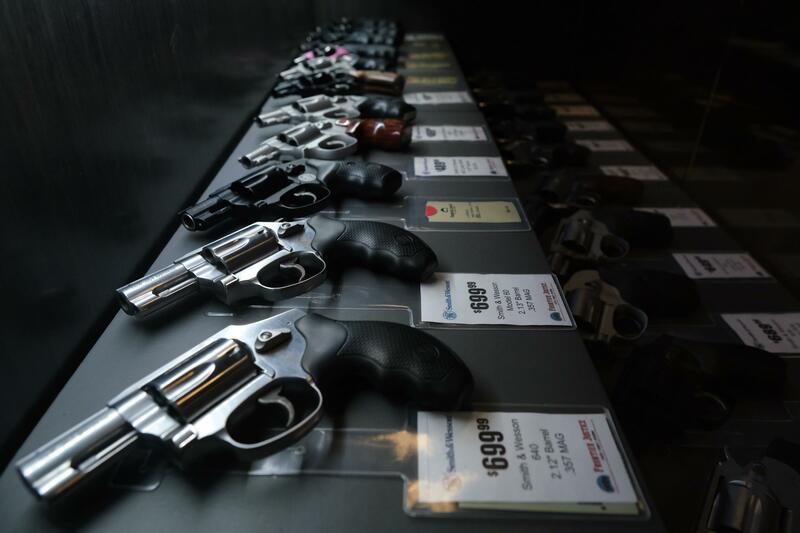 "Often you find a male sales associate who stands behind the counter that's full of guns. And then there are guns behind them as well ... I hate that. It really makes a person feel very small and very powerless." Brown designed Frontier Justice to be more inviting and instructs workers stationed in the women's boutique to greet customers when they walk in the door. It's "fashion-oriented destination shopping," she says. "So things that you can't find ordinarily in [the Kansas City area], really upper-end fashion." Toward the back of the store, guns are kept in cases like those found in jewelry stores. Brown says she wants customers to see the firearms "up close and personal." 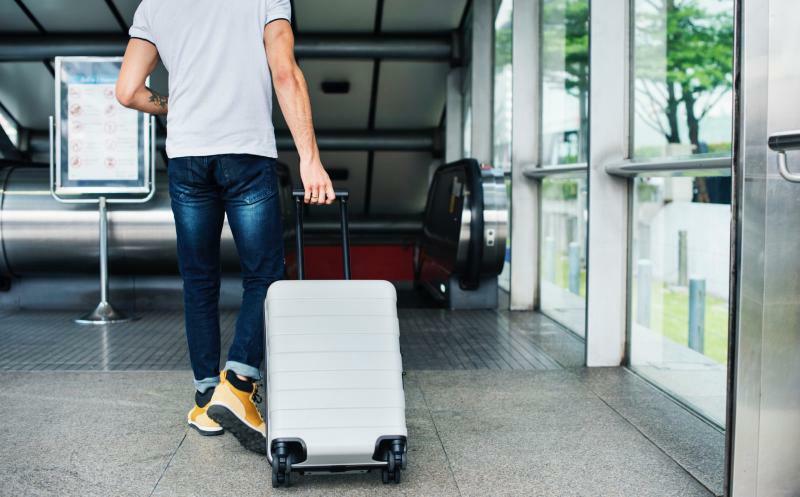 The cases also allow salespeople to approach customers from the side, which she hopes gives customers a sense that "it's not them against you or you against them." Cases modeled after those found in jewelry stores are positioned throughout Frontier Justice. The idea is to let customers view the guns from different angles. "The big-box stores are great for people who have hunted and fished their whole lives," she says. "And the mom and pop is really great for a guy who knows a lot about guns." "But somebody who's brand new to [guns], who maybe shot once with her grandfather but hasn't shot again since then or has never shot before ever in their lives, they really don't have a place to go," Brown says. "And we feel like that's the majority of the population at this point in America." It's tough to pin down specific numbers, but Brown says retail firearm sales are clearly down since 2016 when Donald Trump was elected president, in part because, by then, many people had purchased firearms in anticipation of possible anti-gun legislation had Hillary Clinton won the election. Brown says some retailers have reported a 30 percent drop in sales since Trump was elected. Statistics from the FBI's National Instant Criminal Background Check System show more background checks for gun purchases were run in 2016 than in any other year on record. In 2017 they dropped by about 8 percent. And while they are on pace for slight increase in 2018, the total will almost certainly stay below 2016's record levels. But such data is at best a proxy for gun sales because not every background check results in a purchase, and some background checks are for purchases made online. Plus, almost half the states have their own background check system for some or all firearm sales. "The Trump slump is a real thing," Brown says. "I voted for Trump and I'd vote for him again because I think he's the best thing for our country right now, given the choices at hand in the last election. But it certainly has not been good for business." When the Browns first contacted Jeff Tesch in 2014 with the idea for Frontier Justice, it was unlike anything he'd heard before. Tesch, who is director of business development for Guns.com, has years of experience helping firearm retailers plan and design their stores. 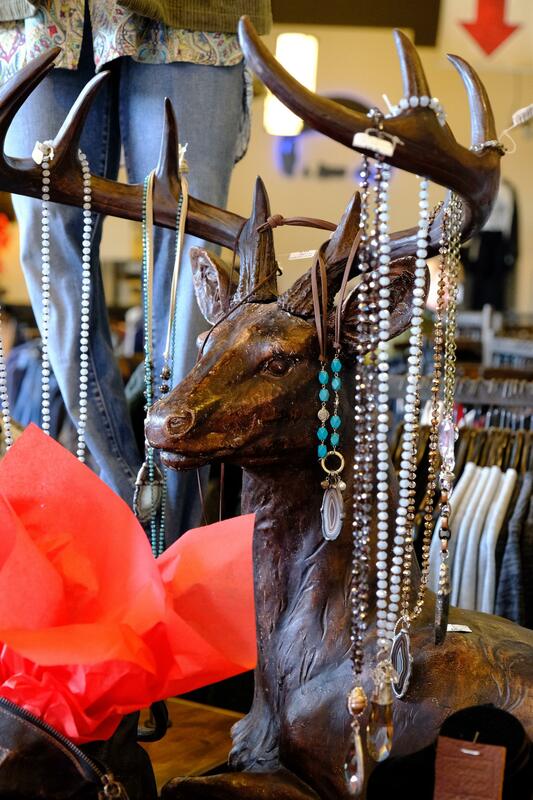 The women's boutique aims for a 'boho-chic' sensibility. The industry at the time was mostly focused on tactical retail stores and ranges, he says. And while there was an emerging trend of high-end gun stores — so-called "guntry clubs" — Tesch says the Frontier Justice concept was in its own lane. The store has some high-end elements, like personal lockers and a swank VIP room for people who buy a membership to the store's on-site shooting range. But there's more for women than the traditional "pink gun offering" sometimes found in other gun stores, Tesch says. "It became clear that this was not just another indoor shooting range [and] firearms store. This was something different, something unique." As the industry works through the current "headwinds," Tesch says, the retailers remaining profitable are the ones that market well and work to create a "tribe effect" with their customers. With subtle touches such as a scent machine that wafts grapefruit and vanilla fragrances through the air, Brown hopes to elicit the feel of a luxury department store like Nordstrom, which has maintained steady profits in its own wobbly retail sector. But other aspects of the Frontier Justice shopping experience speak more overtly to the Browns' values. 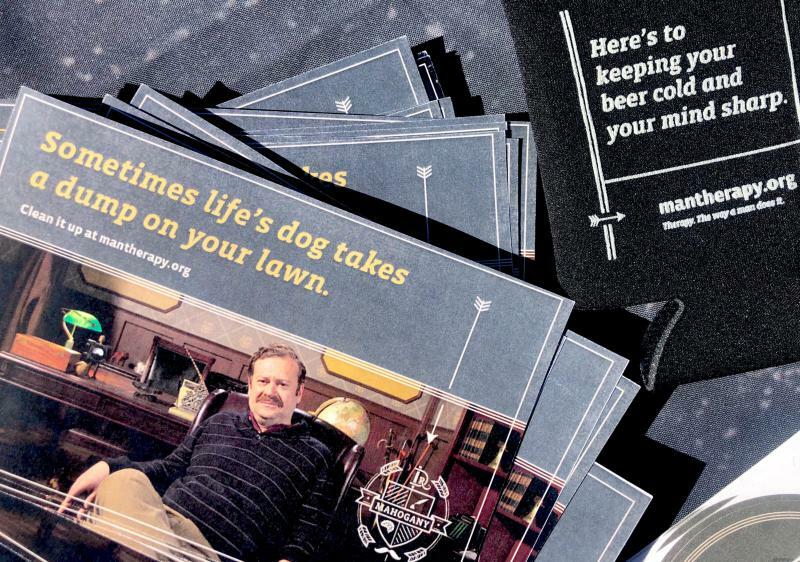 The unofficial Frontier Justice motto of "faith, family, freedom" receives prominent placement in signage and marketing materials. A sticker on the front door informs customers that the store donates a portion of revenues to Christian charities. Brown believes attracting more families to the firearms community will lead to stronger Second Amendment protections for future generations. "Children are the key to that," she says. "Creating this environment where women feel comfortable coming in is crucial. Because no woman is letting her child go somewhere she doesn't feel comfortable." The concept of 'faith, family, freedom' is central to the Frontier Justice message. For years there have been scattered reports of more women purchasing guns but the trend is difficult to prove. In 2017, the Pew Research Center estimated that 22 percent of women personally own a firearm compared to 39 percent of men. Screenshot from 'Spirit of the Huntress,' one in a series of short videos produced by NRATV under its 'Armed and Fabulous' banner. It tells the story of a woman's hunting trip to South Africa. 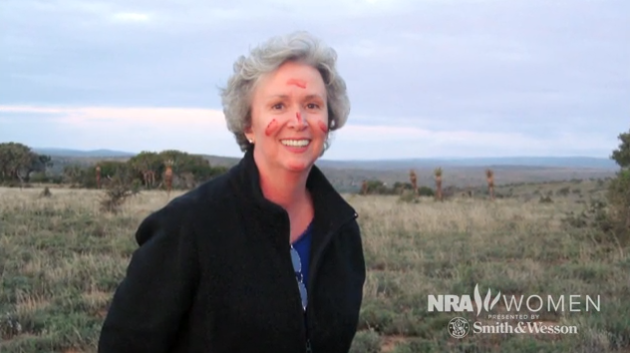 Her face was smeared with the blood of an ostrich to celebrate her first kill. Polling from the General Social Survey, a longstanding project run by the University of Chicago's National Opinion Research Center, found that between 1980 and 2014, the number of women who own guns has fluctuated no more than a couple points above or below the average of 11.2 percent. But the National Shooting Sports Foundation — a firearm industry trade association — argues that many gun owners won't tell a stranger whether they own a gun, and that "the political climate" is further driving down self-reporting. The industry has much to gain by enticing more women to buy firearms. Women control about 30 percent of the world's wealth, according to research released in 2016 by the Boston Consulting Group. That's up from 25 percent in 2011, and the rate is expected to keep growing about 7 percent annually. In 2014, firearms manufacturer Ruger and retailer Cabela's partnered to create the "Ruger Experience For Women," featuring multi-day firearms training on an Arizona range, a Ruger compact pistol and a spa gift card. NRATV, the National Rifle Association's online television networks, has a collection of programming for women, including a video series called "Armed and Fabulous" that features girls and women who shoot firearms. The fashion boutique is located near the entrance of Frontier Justice. Back at Frontier Justice, their approach appears to be paying off. Year over year sales at the Lee's Summit location are up 10 percent, according to Brown. And last year, Frontier Justice opened a second store in Kansas City, Kansas. Brown says they've been approached by other developers about opening more locations across the country, but for now she and her husband are focused on expanding online sales. Nugent, Knox and Corum, the trio of septuagenarian shooters, say they drove more than an hour from their respective homes to visit Frontier Justice even though there's another shooting range much closer. The women don't like the other, closer range, Knox says, because it's "nasty and dirty." Nugent, the first time shooter, doesn't have much interest in returning to the Frontier Justice shooting range. It was more of a bucket list item than a new hobby, she admits. But her friends come every week, and Nugent likes "the little boutique," so she says she might tag along anyway. Chris Haxel is a reporter for KCUR 89.3. Email him at chaxel@kcur.org, and follow him on Twitter @ChrisHaxel. Guns & America is a public media collaborative focused on the role of guns in American life.